Catherine Cangany can’t stop thinking about fakes. Luckily, the American Council of Learned Societies (ACLS) doesn’t want her to stop. Cangany recently won an ACLS fellowship for her proposed research project “An Empire of Fakes: Counterfeit Goods in Eighteenth-Century America,” which will analyze counterfeit goods travelling around the Americas during the colonial period. With the grant, Cangany will take the next year to conduct research in London, Boston, New York, and Charleston, S.C. She also won a six-month fellowship, funded by the National Endowment for the Humanities, to research at the John Carter Brown Library in Rhode Island. Her research is grounded in the past, Cangany says, but it is a topic that resonates today. Cangany’s interest in the colonial period began when she once lived in Washington, D.C., and spent her spare time visiting historic sites. Her budding interest compelled her to return to graduate school and study history. 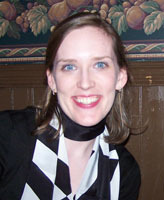 While at the University of Michigan, Cangany completed her dissertation on colonial Detroit. Part of her research for that project involved a look at counterfeit moccasins. “I enjoyed that needle in a haystack work so much that I decided to continue it,” she says. In fact, she says, her favorite part of any history project is the archival work. Wherever her project takes her, Cangany is in good company. This year, three other faculty members in Notre Dame’s College of Arts and Letters have been awarded ACLS fellowships. The ACLS selected just 65 winners from among 1,121 applications this year. “It’s really an honor,” Cangany says. Originally published by Eileen Lynch at al.nd.edu on April 22, 2013.